Publisher Excalibur has announced that Out of Bounds Games’ twin-stick shooter Laser Disco Defenders is coming to the PS Vita in late July 2016 digitally via the PlayStation Network. Laser Disco Defenders has a strong influence of the disco era. For those of us who have been around for long enough to remember, the outrageous disco costumes of the 70’s also had their influence in sci-fi movies – the game pays homage to that space, sci-fi and disco union. In a bid to defeat the evil Lord Monotone’s plan to control the galaxy – and even worse its taste in music, the Laser Disco Defenders must shoot and dodge lasers in a series of randomly generated levels. Each character is reminiscent of the 70’s disco era with flamboyant outfits and suits to strut their stuff in. 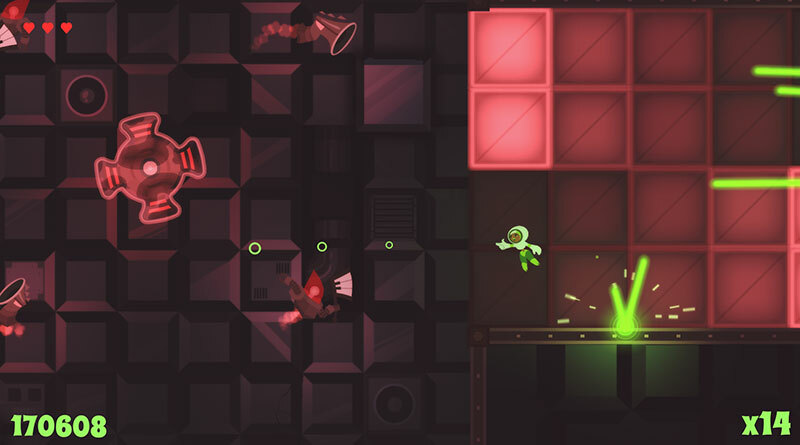 The player can choose the look and style of their character and then send them off as they battle their way through each level taking care not to be hit by the ricocheting lasers. Thanks to the randomly generated levels no play through is ever the same and the “master of the dance floor” can be viewed on the online leader boards. New zone – Dance Den – Square but beware! The Dance Den is a series of square rooms taking place inside Lord Monotone’s massive flagship The Screeching Solo. Although a square environment should make calculating the trajectory of the lasers easier, the Dance Den features some claustrophobic chokepoints that your enemies will make use of to prevent you entering new rooms. The new zone also features deadly tiles reminiscent of classic disco dance floors. As you get further into the Dance Den the patterns blinks on and off in increasingly complicated patterns so you have to stay on your toes! Monotone has also bolstered his ranks with new enemy types. One of these is the Trumpet Troopers that if left to their own devices will fill the Dance Den with even more lasers. The Defenders are just a few misplaced shots from a ballistic nightmare from which no one can survive, adjust your aerial positions and make the best use of the square environment and watch your shots wipe out the robotic menace!